ArabSaga: Is Iraq preparing to dump Assad? Has Iraq decided to turn its back on Syrian President Bashar al-Assad? The $64,000 Question came hot on the heels of Iraqi Foreign Minister Hoshyar Zebari’s address at the opening of the Syrian opposition groups’ conference in Cairo earlier this week. Zebari then called for a peaceful transition of power in Syria, pledging to help in that endeavor "so that representatives of the Syrian people take over their political process and build their modern Syrian state." Zebari’s utterances suggest Iraq is perhaps pondering what lies ahead across its border, says senior diplomatic correspondent and political analyst Raghida Dergham today in her weekly think piece for the pan-Arab daily al-Hayat. A more comprehensive analysis of Iraq’s Syria reset comes from Syrian Kurdish analyst Farouk Hajji Mustafa. 2. The Iraqi leaders’ internecine power struggle is the other explanation for Baghdad’s new discourse supportive of the Syrian opposition. Prime Minister Nouri al-Maliki could be telling Iran he would cross the aisle if it let him down. Alternatively, “the shift could be traced back to Massoud Barzani,” head of the Kurdistan Regional Government (KRG) in Iraq. In other words, “the new discourse could be expressing the view of the government in Erbil, not Baghdad.” Barzani has repeatedly warned Maliki he can change the power balance in Baghdad if it didn’t stop canoodling with Damascus. 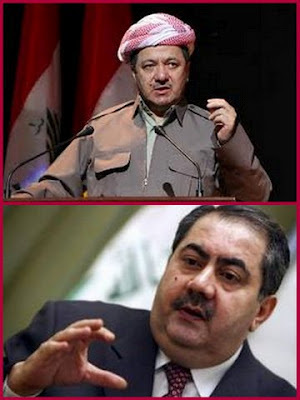 The KRG leader, in other words, has put Maliki on notice that he was putting his alliance with the Kurds at risk.